Moving further north, the moors start to take over and the landscape becomes wilder and more remote. Arkengarthdale is perfect for those who prize their solitude, unless they want to sample local beers at England's highest pub at Tan Hill. On the moors you’re likely to see the small, shaggy and hardy Swaledale sheep. 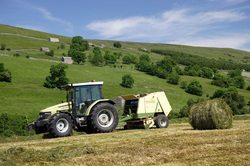 They are key to the livelihood of many Dales farmers and the emblem for the Yorkshire Dales National Park. Many people will recognise a special part of Swaledale from the title sequence of the TV series 'All Creatures Great and Small', when Siegfried’s car splashes through the stream. This beautiful spot sits in a dip in the moors beside the minor road from Low Row to Arkengarthdale, and is the perfect place to relax and take in the scenery while you enjoy a picnic of delicious local food. Swaledale’s only town is Richmond, where the 100ft high Castle walls and sloping cobbled market place dominate the town. The Georgian Theatre has an intimate feel and fascinating history and at nearby Richmond Station you can enjoy a film and visit artisan food producers. Busy local events include the Swaledale Festival, and Muker and Reeth Shows. Stopped for a drink at the world famous Tan Hill Inn and admired the view from the country’s highest pub!